Fair enough, Mr Ramis, but since when did I ever let something as trivial as the truth of the creator of something get in the way of a good opportunity to offer my own take? Anyway, I don't agree with his estimate at all, as you'll see below. Now before I start, a small disclaimer - this article doesn't take into account days in which Phil does nothing (like those days when all you want to do is lie in bed and play with yourself - which he inevitably will have done), so don't go complaining that I haven't factored them in. I actually have, though not explicitly, because my calculation accepts that Phil may have spent time learning some of his new skills on the same day. Don't phone, it's just for fun! So, by my reckoning that's 38 separate days shown in the movie. This is of course assuming that every separate thing listed above happens on separate days, which I think isn't too much of a dangerous assumption, given that Phil is something of a quitter (case in point: multiple attempts at suicide). Electrocution we saw, see it's up there in the list - but the other six account for an additional six days (again assuming they weren't on the same day). Which brings the running total up to 44 days. But then that isn't factoring the number of days of perpetuation that it would take to force a man who is already thoroughly depressed to attempt suicide - delicate matter, but since Phil is an entirely self-centred man, trapped in his own idea of hell, and surrounded by "hicks", you'd have to wager that normal circumstances wouldn't apply. If it were me, a month would be more than enough time to drive me to despair, and I'd say Phil Connors was at least as self-aware as I am, if not more given that he gives up "living by their rules" on day 3 - so let's factor in 20 more days at this point. That's 64 days so far. "Six months. Four to five hours a day, and you'd be an expert." So, that's 6 months added to the 62 days, bringing the running total to 244 days (taking a month as 30 days). "It's like I said: I love this film. I've seen it over 100 times." There's another 100 days then - seriously, who would see the same film twice in the same day? Especially when its Heidi 2... New total so far: 344 days Add to that two full days of Jeopardy watching to be able to perfectly recite the answers (spread over some other days no doubt - but probably empty days, considering Phil's mood at that point in the movie) and you have 346 days. Then of course there's the diner scene in which Phil explains to Rita that he is stuck reliving Groundhog Day, and uses his extensive knowledge of the other diners to prove his point - let's give each person a day (ignoring Nancy, as she's in the original 38 on-screen days), since he clearly knows a lot about them. So that's a day each for Doris the waitress, Debbie and Fred, Phil the waiter, Gus the drunk ex-sailor, Tom the former coal miner and Alice the waitress, totalling 6 additional days, bringing us to 352 days. And finally, in this section are the few odd bits and pieces mentioned on screen that would have taken some time, including sourcing a Rolls Royce and Cowboy outfit in small-town Punxsutawney and meeting his French maid companion, discovering the candy store, finding out that Rita likes Rocky Road, and generally learning everything there is to know about Rita. Next up, there's the third stage of the operation - taking the things Phil achieves on screen that imply he has spent time learning new skills, and attempting to use educated guess work, and other reference points to work out how long each achievement might have taken. Armed only with Google, and a healthy curiosity, I set out on this part of the quest with incredible gusto. Then I had a lie-down and watched Hot Shots: Part Deux instead. But then I got back on it: First there are the big two - learning how to make ice sculptures and how to play piano from scratch. The ice sculpture business is pretty difficult to quantify, though you would assume that being in show business he has some interest or background in art, so even if he went in as an ice virgin, he might learn faster than another person. I'll also assume he is self-taught, which is bound to take some time (top Ice Sculptors in London Eskimo Ice can only call themselves top of their game due to 25 years of experience), and portraiture's got to be the most difficult style to master. 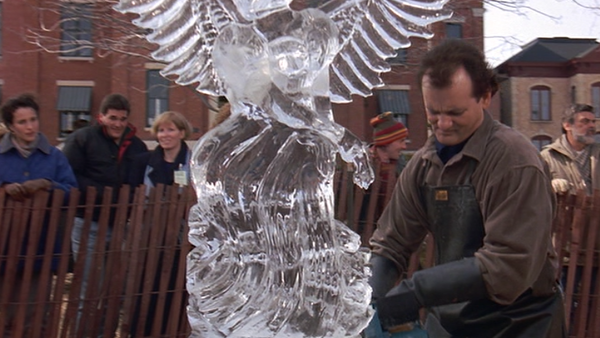 In conjunction with that, Malcolm Gladwell has stated that it takes anyone 10,000 hours to become an expert at any one subject, and Phil is clearly an expert ice sculptor, since the ice sculpture is the one thing in Groundhog Day that is entirely quantifiable by what we can see on screen (playing one song well does not make anyone an expert pianist, and speaking one French poem perfectly likewise is not an indicator of expertise). Broken down that is an hour a day for 27 years, but we know Phil by now, and we know that when he figures out that something gets him closer to fourth base with Rita, he's likely to pursue it a little more rabidly than that. So I'm suggesting an average of 4 hours per day - based also on his willingness to stick to 4 or 5 hours of card flicking for six solid months, and the impending threat of frost bite over longer periods - which brings that to just under 7 years, based on him working for consecutive days for that whole time, or more likely 10 years sticking to a traditional 5 day a week working directive. A giant leap to the next running total: 4102 days And then there's learning the piano. Again, you have to consider that 10,000 hours to become an expert - not that we know Phil is an actual expert, in the Mozart mould (took him 13 years to produce world class music after being "discovered" at the age of 4), because he isn't composing or anything. So let's call him an exceptional pianist - three quarters of the way to expert - so 7,000 practice hours. At the level he is clearly playing at at the end, he must have been putting in two or three hours of practice a day at least (any more and he would be in severe danger of carpal tunnel syndrome or tendinitis) though not every day (for the same medical reasons). That breaks down to about 7.5 years playing for between two and three hours a day every day. 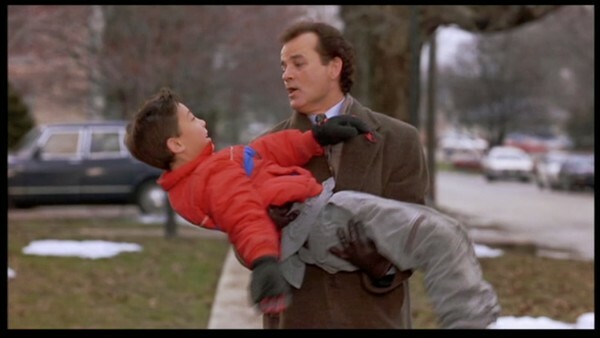 But I've already said I'm working on the basis that he sticks to the habit of five days on, two days off- so that makes it ten and a half years or there abouts (seems Harold Ramis was right about the ten year mark). 10.5 years= 3833 days And a new running total of 7935. As I said, there are other things Phil learns too - it is implied that Phil has learned French when he recites French poetry to Rita - but then, at this stage in the film, Phil has shown that he is more than willing to use deception to get into her knickers, so what's to say that he didn't simply spend a couple of days learning how to perfectly recite the one passage he picks to impress Rita. But that's probably nit-picking, so let's accept that he took lessons (given that Ramis himself also confirmed that Phil learned the language, and that the script confirms it below). Rita: Believe it or not, I studied nineteenth-century French poetry. Phil: Rita: You speak French? Phil: Oui. So, taking into account the fact that America only has about 1.6million French speakers, and isn't strictly speaking a Francophone nation, and the fact that Pennsylvania had no historical French settlement it would presumably have been more difficult for Phil to learn the language than it would somewhere with a large French speaking community. Dr. Connors. I want to thank you for fixing Felix's back. He can even help around the house again. Hang on, he fixed his back?! When exactly did he find the time to learn enough in the medical field to "fix" the back of a man so incapacitated that he couldn't even help around the house?! Oh yeah, right, stuck in an infinite circle of time! Well, I wouldn't think he had actually gone to Medical School (there isn't one in Punxsutawney - and he'd just end up doing first-day induction over and over anyway) or the required four years post-graduate studying to become a chiropractor, but you have to wonder how long it would take an unqualified TV presenter to master chiropractory to that level - or at least enough to wing it (it's a giant law-suit waiting to happen). This one has to be pure speculation - though I did find a useful, teach yourself chiropractory video, of 100 minutes, which you'd think Phil would have to watch at least five or six times to learn off by heart (a low number since he would have some familiarity with learning lines quickly). It's probably also reasonable to suggest that Phil would have read up on the subject before attempting to administer off-the-cuff medical attention on a frail-looking elderly gentleman - say 20 days to be safe. Adding the time it took to source the video (no more a suspension of belief required than his acquiring WWF tickets! ), and the probable few times he practiced on Felix and it didn't quite work out as planned (and assuming each failed attempt then spoiled his entire day), I'd say a very rough bare minimum estimate of 26 days to learn to fix Felix's back. I've already stated (in the disclaimer above) that these periods of learning could overlap - but really, I'm not entirely sure they would: clearly, you couldn't learn to play the piano after spending a few hours learning to sculpt ice (which would necessarily be a morning activity, given the lower temperatures and appropriate lighting). 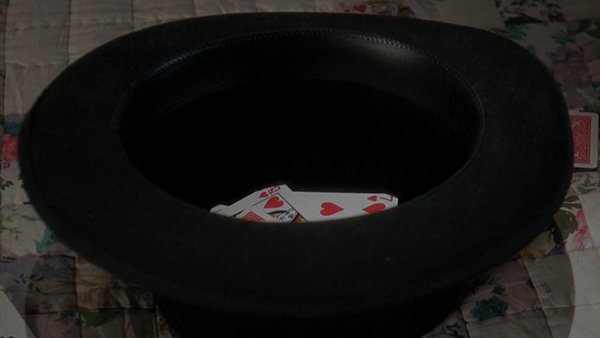 And further, given Phil's professed dedication to each subject (his spending six months learning to throw cards into a hat proves an invaluable bench-mark), I don't think it likely that he would learn each thing in one long, crammed period of time. 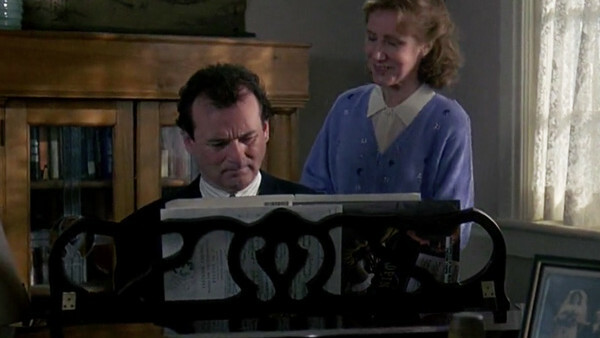 You have to remember, at the stage he is learning piano and ice sculpting, he has seemingly abandoned his desire to leave Punxsutawney, and is revelling in the infinite possibilities for self-advancement. So there. Phil: A gust of wind. Phil: A dog barks. Phil: Cue the truck. Phil: Exit Herman; walk out into the bank. Phil: Exit Felix, and stand there with a not-so-bright look on your face. Phil: All right, Doris, come on. Hey, fix your bra, honey... That's better. Phil: Felix. Phil: How ya doin' Doris? Phil: Can I have a roll of quarters? Phil: Phil: 10, 9, 8, car... Phil: ...6, 5, quarters... Phil: ...3, 2... Herman: Felix, did I bring out two bags or one? Felix: I dunno. 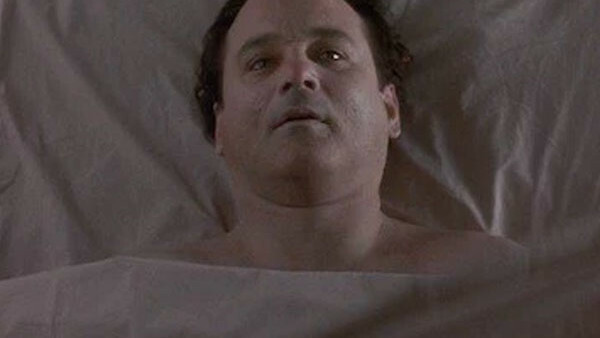 So, to those soul-saving gestures: the real things that get Phil out of his perpetual loop, rather than the things he learns in order to get into Rita's underwear. 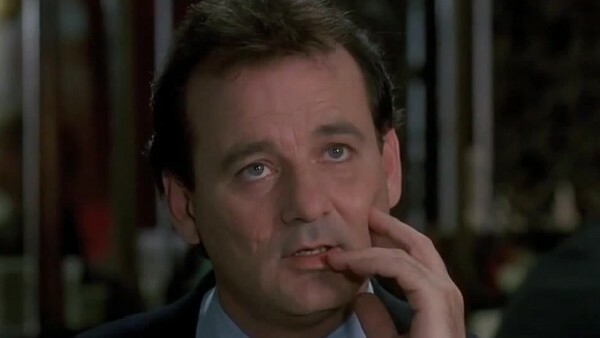 So if my math is right (it probably isn''t) that means something like... 413 months 1766 weeks 12,395 days 297, 480 hours 17, 848, 800 minutes So next time you are asked... "Hey, just how many days does Bill Murray spend locked in Groundhog Day?" - The answer my friends, is, 12,395 days!! That's a far shout from that 8 years figure bandied about in that article mentioned above - and even further away from the 10,000 years that were supposedly mentioned in the initial drafts of the film. I can only thank my lucky stars I didn't have to go to those lengths! 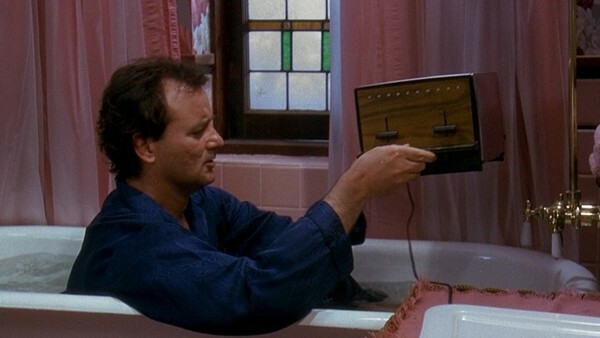 All that effort to find out that Harold Ramis was pretty much right in the first sodding place. It's alright though, man was a ! *$% genius. 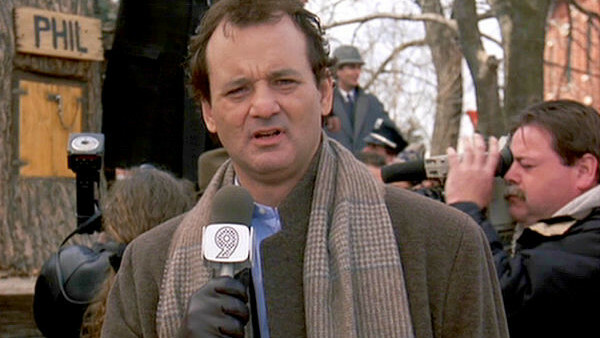 For anyone who wants to check all of this, I really don't suggest watching Groundhog Day in this manner. 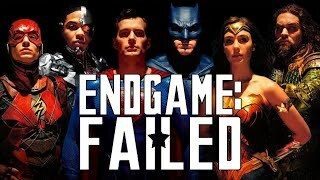 It's not the best way to enjoy what is essentially a light-hearted comedy whose metaphysical concerns are supposed to be enjoyed in fun, and not worked out mathematically. 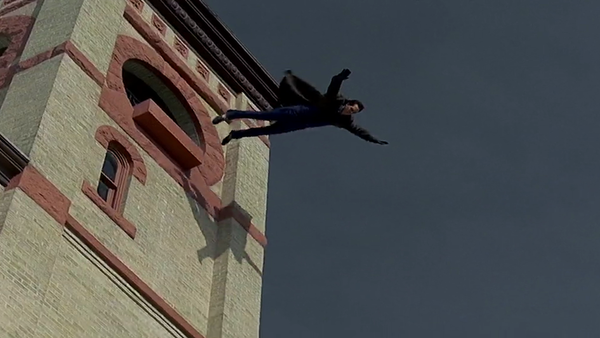 Normal people should be happy to just watch, and accept that Phil Connors is stuck repeating his one day endlessly over and over until he finds himself- but then, I don't think I'm normal. P.S. You can follow me on Twitter @SiGallagher. Get following!